For ages 12 and up. With a number of levels for all ages that will teach children and adults alike how to swim using a bio-mechanical approach. With a number of levels allowing us to break up the steps of the four main strokes making it easier for students to learn the most efficient and effective way. 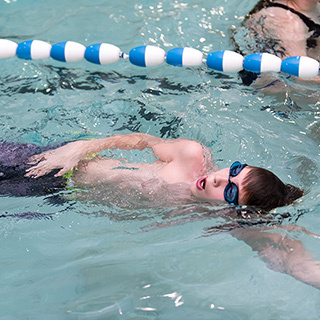 For the Beginner and Basic swimmers we place ages 12-Adult in 30 min semi private lessons during times that are generally later allowing for more space in the pool. Basic Swimmers: Our next 5 levels ( Pre Junior Silver, Pre Junior Gold, Junior Bronze, Junior Silver and Junior Gold) establish the technique, eendurance and strength of Front Crawl and Back Crawl. Concentrating on proper form, breathing and kick so that the student can safely get from point A to point B. Advanced Swimmers (ages 12-16): The next 5 levels ( Intermediate Bronze, Intermediate Silver, Intermediate Gold, Senior Bronze and Senior Silver) Butterfly and Breast Stroke are now being introduced to improve stamina, and power in the four strokes. Once the student has mastered Senior Silver you can be confident that they are a good swimmer and will be fine in a recreational setting. These classes are all 40 min small group classes of 4. Superstars (ages 12-16): The remaining levels ( Senior Gold, Master Bronze, Master Silver, Master Gold and Royal Olympic) are geared towards those who wish to improve their speed, strength and technique. Continuing with swimming is a great sport for a variety of reasons. Good health, physical activity, preparing to join a swim team, preparing to join an aquatic career and an opportunity to participate in a physical activity in a small group environment. These classes are all 40 min small group classes of 4. This is a program for teens and adults who are advanced swimmers or higher. Swimming is a great form of exercise that is easier on the joints than a typical gym work out, but burns major calories. Whether you are training for a full on Iron Man or wish to do a Try-a-Tri this program allows you to have fun make friends and get in a valuable work out. Bronze Medallion, Bronze Cross and Swim Instructors certificates are all programs to assist in advancing in a career in the aquatic field. Great additions to any resume and for some jobs a requirement. With a variety of first aid programs to choose from including but not limited to Standard First Aid, Family first aid workshops, Babysitters programs, Stay home alone program and more.